Benjamin Bloom (1956) developed a classification of levels of intellectual behavior in learning. This taxonomy contained three overlapping domains: the cognitive, psycho-motor, and affective. Within the cognitive domain, he identified six levels: knowledge, comprehension, application, analysis, synthesis, and evaluation. These levels were revised in the 1990's. These domains and levels are still useful today as you develop the critical thinking skills of your students. 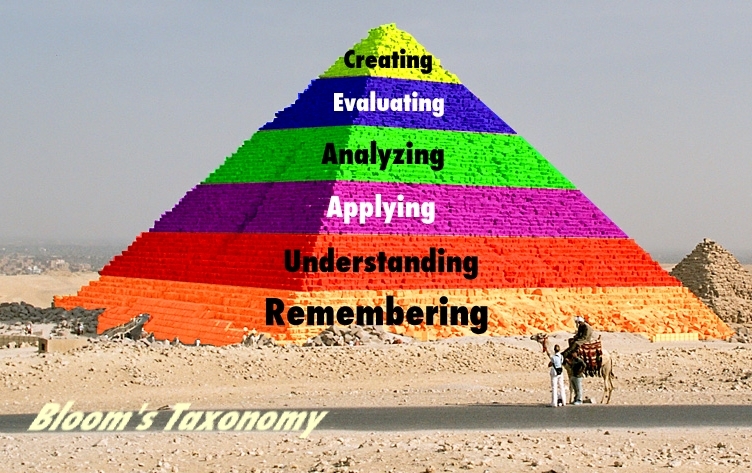 Bloom's Taxonomy Pyramid (below) showing the highest level of thinking at the top and working its way down. Note that "Creating" is the majority of thinking done in the fine arts. Evaluating and analyzing comes from art criticism, applying is using what you learn in your art. Understanding is understanding the various art styles, periods, and using that in your art. Finally, remembering the art elements and principles of design. Classroom critiques use Bloom's Higher Order Thinking Skills - See these sample questions by Craig Roland. Create a sculpture, painting, collage, drawing, etc. Does the art use complementary color? Does the picture direct eye movement to the main subject of the painting? Is the picture in balance and represent the style well? Why? In what ways does the picture illustrate various elements and principles of art? What is the artist's main message of their art? What is your opinion of the painting? If you could interview the artist, what questions would you ask? What is the subject or theme of the picture? Why is this considered an Impressionist painting? What style of art did Van Gogh paint in? Previously, Blooms Taxonomy was listed as evaluation, synthesis, analysis, application, comprehension, and knowledge. A student of Bloom's, Lorin Anderson, updated the taxonomy in the 1990's. Lorin's team represented cognitive psychologists, researchers, and assessment specialists. They spent six years finalizing their work. See Blooms' Taxonomy Revised (Archive) - This page includes PowerPoints on Blooms. Blooms Resources (Posters and Handouts) Free downloads - You can download free handouts with questions according to Bloom. This site includes other educational thinking resources in New Zealand. Blooms Taxonomy of Learning Domains - This page lists the three learning domains and incorporates Blooms in each category. Learning Skills Program - Bloom's Taxonomy - nice concise listing. Applying Bloom's Taxonomy (Archive) - With sample questions and activities. Critical and Creative Thinking - Lists higher order verbs and links. Pearltree's Critical Thinking - This is an excellent interactive site and a must-see for teachers. The page includes Socratic questioning, foundations for critical thinking, flow charts and videos. Answering Questions using Bloom's Taxonomy of Learning Domains - A summary of the domains and a collection of pertinent links. See It's the Thought that Counts [Archive] - A copy of a handout from Craig Roland's session on “Teaching Thinking in the Art Classroom” presented at the National Art Education Association Conference in New York on March 16, 2001. Has links to two PDF files linked on that page.